The comments period may have ended, but changes are still coming to Accounting Standards Update (ASU), titled Clarifying the Scope and Accounting Guidance for Contributions Received and Contributions Made. FASB issued a call for comments, which ended November 1. The proposed changes would clarify revenue recognition for contributions received and made and help nonprofits account more clearly for certain types of funds. What Is the Proposed Change and Framework? The changes are intended to help nonprofits distinguish between contributions (nonreciprocal transactions) and exchange (reciprocal) transactions. The changes also hope to add clarity to conditional and unconditional contributions. The results of the proposed framework changes may, in fact, push more grants into the category of contributions. Under the new framework, if grants are deemed to be exchange transactions, then the revenues should be recorded as per the guidelines under Revenue from Contracts with Customers (Topic 606) or other applicable topics. Grants determined to be contributions should be recognized instead as revenues in accordance with Subtopic 958-605, Not-for-Profit Entities–Revenue Recognition. Nonprofits still have a majority say in how grants are categorized. Their first step is to determine whether a particular grant is a revenue or exchange transaction. If the grantor receives services of comparable value, it is usually safe to say that a transaction is an exchange. The good part of the proposed guidelines is that the FASB includes numerous examples to help nonprofits understand the proposed framework and determine for themselves how the revenues will be categorized. Nonprofit still have a great deal of latitude in how and why they categorize particular revenues. They must, however, adhere to their own internal logic and establish guidelines based on the overarching, generally accepted accounting standards. If the proposed changes do take effect, they won’t impact nonprofit reports until 2019 or 2020. They may impact organizations with the calendar year ending in 2019 or the fiscal year ending in 2020. Accounting actions completed before these dates may follow the old guidelines, which gives organizations plenty of time to update their accounting methods. If significant changes are made between the previous books and the new books, under the changed guidelines, the reason for the change should be noted in the financials next to each line that is affected by the change. Although it may seem as if accounting for nonprofits should be straightforward, grants represent an area with the potential for considerable gray areas. Nonprofit financial managers should look at the intention of the grant, whether any reciprocal action or stipulation is required, or how the grant must be satisfied. Straight grants with no conditions attached are the easiest to recognize in revenues. Others, that come with conditions need careful, thoughtful attention. Developing your own set of revenue recognition rules that are in line with the FASB recommendations may be helpful to keep your organization consistent in how it manages its grant funds. 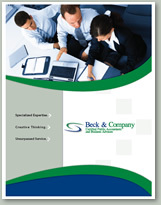 Beck & Company is a certified public accounting firm serving the greater Washington D.C. area and the Eastern seaboard. We offer consulting services, auditing, and software selection to help nonprofits with their accounting needs. Contact us today for more information or assistance.